When I arrived last Thursday afternoon the scene at the school gardens of the Discovery School at Four Corners were enjoying controlled chaos. Several teachers were staying after school to divide and pot up perennials from the butterfly garden. “Is this Echinacea or a rudbeckia?” one teacher asked and her spade bit into the center of the clump. “Don’t pot the dill! It an annual,” another shouted. “Are you sure these are all bee balm?” another asked looking at a huge clump of wilted and frost-blackened stems. All of the newly potted plants, as well as kale and potatoes from the garden, were to be sold at the Harvest Sampler the following day. Funds raised would go to the school gardens. I have visited many school gardens, but never have I visited a school where the garden was a driving force in the curriculum. The DiscoverySchool at Four Corners (K-3) was one of the first Innovation Schools created by a program instituted by Governor Deval Patrick in 2010. 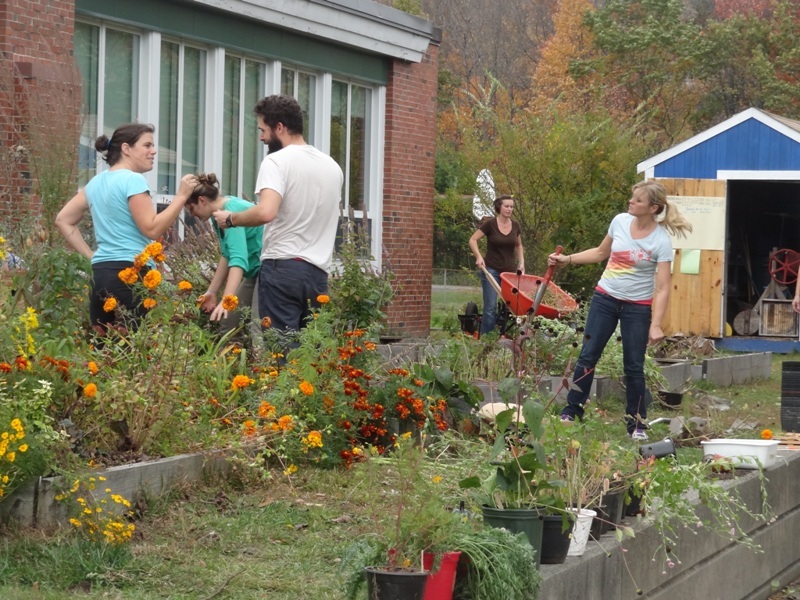 Innovation schools have a theme; the teachers and parents who came together to design this new program chose gardening, with a broad environmental focus. On the day I visited several of the raised garden beds were nearly finished and ready for the final harvest. Others already showed a sturdy growth of winter rye, a cover crop that will be tilled under in the spring to fertilize the soil and add organic matter. My neighbor, and teacher at Four Corners, Kate Bailey told me the kids love the gardens, and the harvest. She has her own reasons for loving the gardens. “It is very easy to integrate the gardens, and cooking the produce, into the curriculum. When we planted the rye we talked about grains. When we cook, and we’ve made a lot of muffins with our harvest, we need many skills. To cook you need to read, follow directions, and of course handle lots of fractions,” she said. The first graders have been studying tomatoes. Lots of salsa has been made. The second graders have been studying carrots which leads to carrot salads, muffins and cakes. The third graders have been studying potatoes. Potato chips! Bailey explained that volunteers from Just Roots, the GreenfieldCommunityGarden who helped set up the garden in the beginning, have been coming in every week to talk about Healthy Snacks. In fact the desire to teach children the importance of a healthy diet was one of LaBreck’s goals. “Children who work in the garden, and grow their own vegetables are more willing to try new foods,” she said. Teacher Anne Naughton stopped potting up plants long enough to tell me how excited she is about working with children in the garden. “The kids love the gardens, and they love the butterflies, and all the insects. They are so curious and interested. Their curiosity leads us into our lessons. We follow life cycles of plants and insects, and seasonal cycles. The first scientific skill is careful observation,” she said. At Friday night’s Harvest Sampler, held in the school yard near the gardens, it was clear that there is great support for the program. A huge turnout of parents arrived bearing their own contributions to the Sampler, more apple, tomato, carrot, and potato dishes. Who imagined learning could be so delicious? The Massachusetts School Report Card shows students the DiscoverySchool at Four Corners have high levels of proficiency or better English Language Arts and Mathematics. It’s clear the teachers at the DiscoverySchool at Four Corners all get high marls themselves. 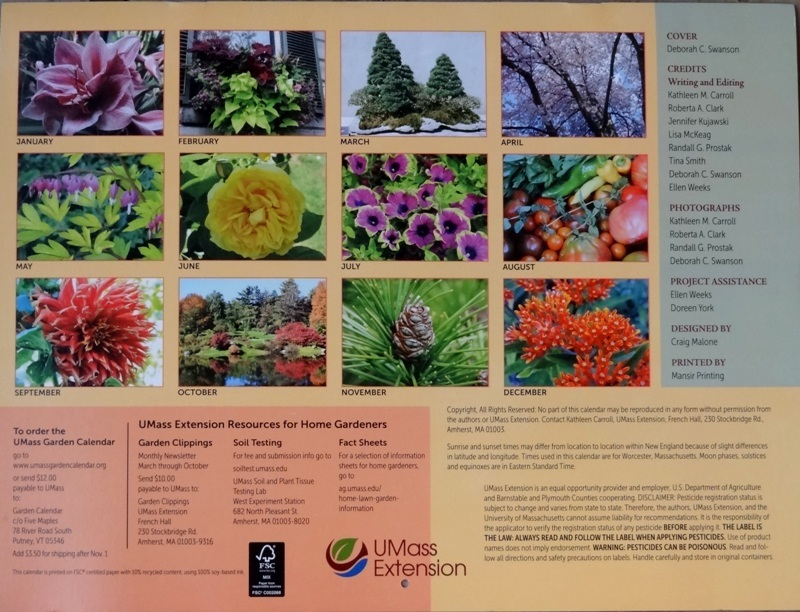 The 2015 UMass Extension Garden Calendar is now available. This excellent, and beautiful, calendar contains excellent information about plants and garden chores throughout the year. To order send $12 payable to UMass, to Garden Calendar, c/o Five Maples, 78 River Road South, Putney, VT 05346. Add $3.50 for the first calendar and $2.00 for each additional calendar. Think of all the gardeners in your life you could make happy. I really enjoyed this post Pat.. My first thought was that maybe I should pack up my family and head west, lol. We really don’t have to as we are blessed with school gardens in most of our schools here in Salem and I believe that their being used in a similar way. I will be sharing this with several of my friends here just to keep the inspiration going!